Public health • Screening saves lives, and delays can have devastating consequences. Al Hartmann | The Salt Lake Tribune Laboratory technicians check the viability of blood samples on the first newborn screening cards at the Utah Department of Health lab. Sometimes the forms are filled out incorrectly and others don't have testable blood samples. Utah hospitals are slower than most of their peers nationally in processing heel prick tests that determine if newborns have rare fatal diseases. 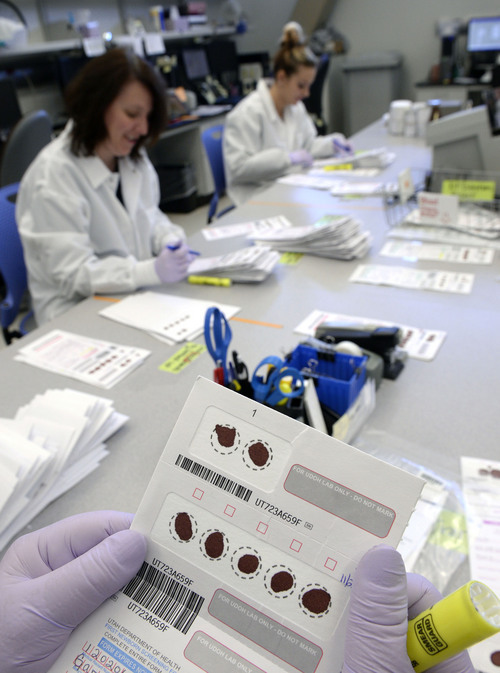 Al Hartmann | The Salt Lake Tribune Laboratory technicians check the viability of blood samples on the first newborn screening cards at the Utah Department of Health lab. Sometimes the forms are filled out incorrectly and others don't have testable blood samples. 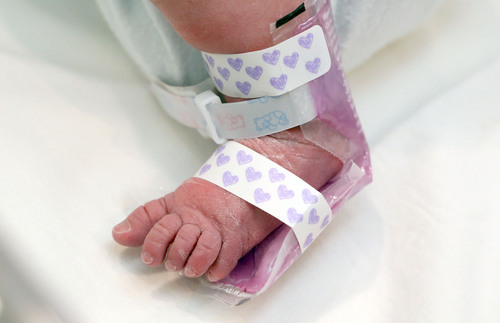 Utah hospitals are slower than most of their peers nationally in processing heel prick tests that determine if newborns have rare fatal diseases. Francisco Kjolseth | The Salt Lake Tribune St. Mark's Hospital Labor and Delivery staff warm up the foot of Mackenzie Glauser, less than two days old, to increase blood flow for a blood test. Virtually every baby born in Utah undergoes a "heel prick" test, or newborn screening for over 30 diseases from seven small drops of blood. The diseases are treatable but can be disabling and deadly if not promptly diagnosed. But many hospitals take 5 days or more to deliver samples to the state lab – too long, according to informal standards embraced by most public health authorities. St. Mark's Hospital is among those that have made a concerted effort to expedite tests. Francisco Kjolseth | The Salt Lake Tribune Seven drops of blood are drawn from the heel of Mackenzie Glauser, less than two days old, at St. Mark's Hospital Labor and Delivery. Virtually every baby born in Utah undergoes a "heel prick" test, or newborn screening for over 30 diseases. The diseases are treatable but can be disabling and deadly if not promptly diagnosed. But many hospitals take 5 days or more to deliver samples to the state lab – too long, according to informal standards embraced by most public health authorities. St. Mark's Hospital is among those that have made a concerted effort to expedite tests. Tardy tests Virtually every baby born in Utah undergoes a "heel prick" test, or newborn screening for 38 rare, inherited disorders. The diseases are treatable but can be disabling and deadly if not promptly diagnosed. But many hospitals take 5 days or more to deliver samples to the state lab – too long, according to informal standards embraced by most public health authorities. Francisco Kjolseth | The Salt Lake Tribune St. Mark's Labor and Delivery RN Amanda Pulliam wraps Mackenzie Glauser, less than two days old, so one foot is exposed to get a blood sample from her heel. Virtually every baby born in Utah undergoes a "heel prick" test, or newborn screening for over 30 diseases. The diseases are treatable but can be disabling and deadly if not promptly diagnosed. But many hospitals take 5 days or more to deliver samples to the state lab ñ too long, according to informal standards embraced by most public health authorities. St. Mark's Hospital is among those that have made a concerted effort to expedite tests. 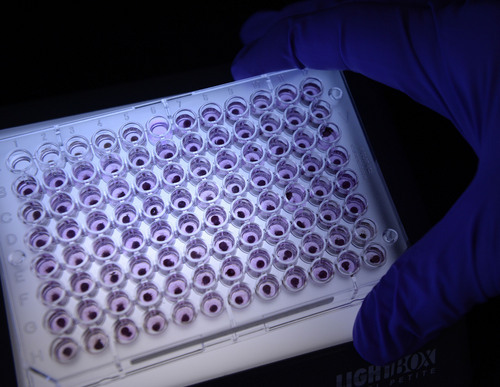 Al Hartmann | The Salt Lake Tribune A tray containing 90 blood samples taken from first newborn screening cards at the Utah Department of Health lab are ready to be analyzed at the Utah Department of Public Health lab. 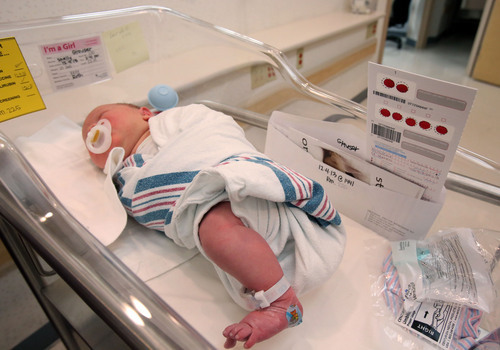 Utah hospitals are slower than most of their peers nationally in processing heel prick tests that determine if newborns have rare fatal diseases. Francisco Kjolseth | The Salt Lake Tribune Mackenzie Glauser, less than two days old, opens her eyes in Labor and Delivery at St. Mark's hospital in Salt Lake where she was undergoing a quick test. 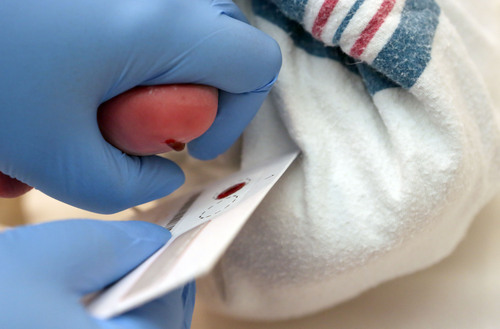 Virtually every baby born in Utah undergoes a "heel prick" test, or newborn screening for over 30 diseases. The diseases are treatable but can be disabling and deadly if not promptly diagnosed. But many hospitals take 5 days or more to deliver samples to the state lab – too long, according to informal standards embraced by most public health authorities. St. Mark's Hospital is among those that have made a concerted effort to expedite tests. 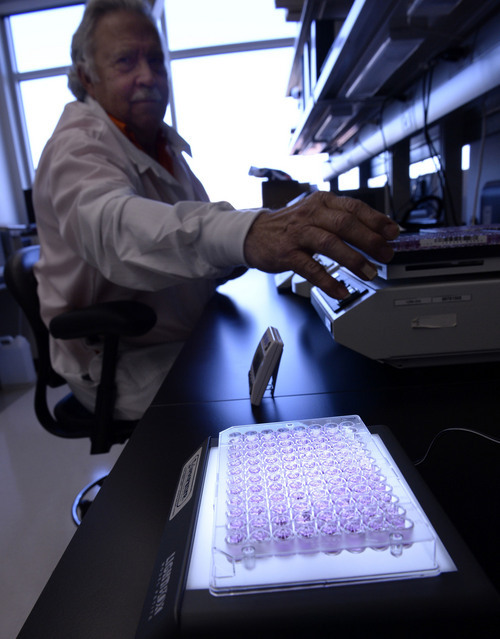 Al Hartmann | The Salt Lake Tribune A tray containing 90 blood samples taken from first newborn screening cards at the Utah Department of Health lab are ready to be analyzed at the Utah Department of Public Health lab. Utah hospitals are slower than most of their peers nationally in processing heel prick tests that determine if newborns have rare fatal diseases. 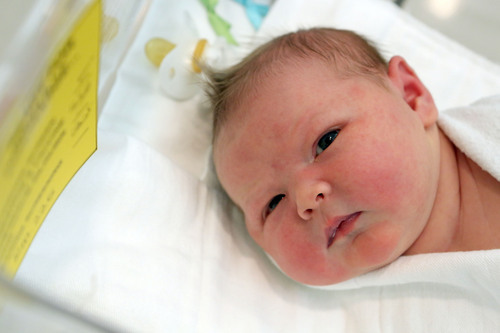 Francisco Kjolseth | The Salt Lake Tribune Mackenzie Glauser, less than two days old, lies comfortably in her burrito roll after undergoing a quick test at St. Mark's Hospital Labor and Delivery on Friday, Dec. 06, 2013. Virtually every baby born in Utah undergoes a "heel prick" test, or newborn screening for over 30 diseases from seven drops of blood. The diseases are treatable but can be disabling and deadly if not promptly diagnosed. But many hospitals take 5 days or more to deliver samples to the state lab ñ too long, according to informal standards embraced by most public health authorities. St. Mark's Hospital is among those that have made a concerted effort to expedite tests. Francisco Kjolseth | The Salt Lake Tribune Mackenzie Glauser, less than two days old, lies comfortably in her burrito roll after undergoing a quick test at St. Mark's Hospital Labor and Delivery on Friday, Dec. 06, 2013. Virtually every baby born in Utah undergoes a "heel prick" test, or newborn screening for over 30 diseases. The diseases are treatable but can be disabling and deadly if not promptly diagnosed. But many hospitals take 5 days or more to deliver samples to the state lab – too long, according to informal standards embraced by most public health authorities. St. Mark's Hospital is among those that have made a concerted effort to expedite tests. Nurses and midwives have been pricking the heels of American newborns since the late 1960s, collecting drops of blood to be screened for inherited diseases. Utah tests for 38 conditions that are treatable but potentially devastating if not promptly detected. With some disorders, small delays can result in lasting brain damage or death. Yet delays are common and largely a problem of hospitals and birthing centers failing to deliver samples to state laboratories on time, according to a recent investigation by the Milwaukee Journal Sentinel. 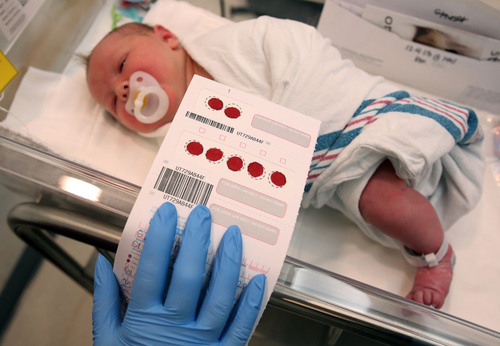 The newspaper analyzed newborn screening data from 31 states, cautioning against comparing states due to differences in data collection. It discovered thousands of samples in Utah arrive at the state lab late, five days or more after being collected. An analysis by The Salt Lake Tribune of the same data examined by the Journal Sentinel found 9 percent of 51,179 samples collected in 2012 arrived late. This year shows no improvement, with 9.4 percent of 40,975 samples collected through the end of October arriving late. "[The Journal Sentinel&apos;s investigation] brought up issues that every single state is dealing with," said Utah newborn screening program manager Kim Hart. Hart isn&apos;t aware of any fatal delays in Utah. "I don&apos;t know of any cases that have ended in death or irreversible damage," she said. That&apos;s due in part, she said, to good communication among hospitals, the state lab and a clinic at the University of Utah that follows up on abnormal findings and coordinates confirmatory testing and specialized medical care for the children. But if delays persist, the chances of crippling consequences grow. Utah is small, delivering about a tenth of the babies born in California. But it&apos;s the fourth fastest-growing state with the nation&apos;s highest birthrate. Utah&apos;s delayed testing rate applied to a state the size of California would equate to about 45,000 late samples. The safeguard of screening • Newborn screening, done under the authority of states, has been called a "triumph of the 20th century public health system," saving lives and money through avoidance of costly health complications. One of the disorders tested for, galactosemia, affects how the body processes a simple sugar called galactose. Infants not fed a low-galactose diet can become sick and die within days from liver damage and bleeding, sepsis and shock, according to the National Institutes of Health. "All you need to do is switch formula. It&apos;s not a frequent disease. None of the diseases we test for is frequent," said Nicola Longo, a pediatrics and pathology professor at the U. who oversees treatment of inherited metabolic disorders at Primary Children&apos;s Medical Center. "But many are treatable, and screening is the only way to identify and effectively treat them," he said. The state lab receives hundreds of tests a day by courier or regular mail, about 50,000 a year. Mondays are the busiest because tests get backed up over the weekend when the lab is closed. Nevertheless, technicians manage to turn around 98 percent of the tests  returning written results to hospitals  within 48 hours. They alert providers of positive results by phone immediately, within 24 hours of the lab receiving the sample. The bottleneck at some rural hospitals and birthing centers, meanwhile, is significant. "Certain hospitals are outstanding and others are less outstanding," said Longo. &apos;A team approach&apos; • As part of a push to improve hospitals&apos; performance, the state Department of Health started issuing report cards, flagging nurseries monthly for holding onto samples and sending them in batches, or for sending late, poor or incomplete samples with missing information. 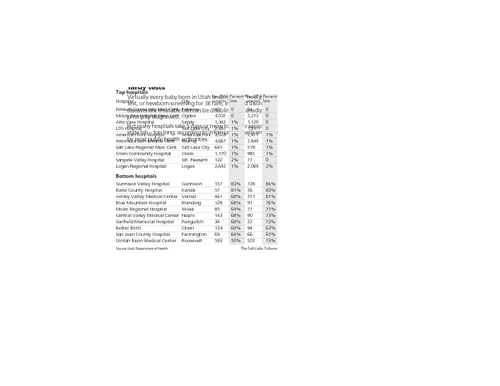 Hospital CEOs receive annual reports. Still, Longo suspects the data hasn&apos;t captured the attention of many hospital administrators. There is no strict national standard, but the consensus nationally is that samples should be shipped within five days, according to the Journal Sentinel. Utah&apos;s rules give providers between 48 hours and five days to collect the sample, and another 24 hours to mail it off. And because the state lab is closed over the weekend, that virtually guarantees delays for samples collected toward the end of the week. The lab could extend hours and process samples on Saturdays, but that would cost money, said Hart. Urban health centers are at an advantage because they are able to send samples to the lab via courier on the same day blood is drawn. Intermountain Healthcare staffs a courier service that picks up samples two to three times a day from its hospitals. But it takes more than couriers to make the grade, explained Mary Ann Hill, director of the delivery ward at MountainStar&apos;s Ogden Regional Medical Center. "It&apos;s been an emphasis for us for about six to eight years," said Hill. Improving turnaround times required getting nurses, phlebotomists and the hospital&apos;s lab to stick to a strict procedure, she said. "It took awhile to get every­one trained and playing by the rules. We had to come out and say, &apos;This is how it will be done. Three strikes you&apos;re out.&apos; It was a team approach," she said. The result: Ogden Regional achieved a near-perfect score last year with fewer than 2 percent of 2,437 samples arriving late. It&apos;s on track this year to match that. Poor performers • By comparison, more than half of samples from 1,749 births at Davis Hospital and Medical Center in Layton arrived late in 2012. The poorest performers are rural health centers, which generally ship samples to the Salt Lake County-based lab by regular mail. An average of 83 percent of the samples collected in 2012 by Gunnison Valley Hospital in Gunnison and 82 percent at Kane County Hospital in Kanab took five days or more to get to the lab. At Blue Mountain Hospital in Blanding, an average of 72 percent arrived late, and at Ashley Valley Regional Medical Center in Vernal, 75 percent – some samples took as long as 10 to 15 days. "We are aware of the importance of genetic testing and of securing those specimens, and delivering them to authorities is a priority for us," said Ashley Valley&apos;s chief clinical officer, Greg Gardner. "We will look into our process and do everything possible to improve it." But there are limits to what rural facilities can do, acknowledge state officials. State rules require that hospitals mail samples by regular, five-day mail. Changing the self-addressed stamped envelopes to three-day delivery is possible but would raise the cost of the $102.99 test, said Hart. "The [Utah] Hospital Association doesn&apos;t like it when we do that," she said. Also, hiking the price runs the risk of uninsured mothers declining to test, she said. Some states subsidize newborn screens with taxpayer dollars, but Utah&apos;s system was designed as more of a user tax, paid by each patient. As a result, Utah&apos;s test is priced above average. It&apos;s still a bargain, considering it screens for 38 disorders, said Hart. "Most people don&apos;t notice the fee because it&apos;s rolled into the total lab fee," she said. "Home birth [patients] notice it, though, because they are paying out of pocket." A home challenge • The rising number of home births – about 800 to 1,000 a year – raises other unique challenges for Utah. Because they are metabolic tests, newborn screens are generally best collected 48 hours after delivery, giving time for maternal hormones to clear the infant&apos;s body. That&apos;s long after midwives have left the mother&apos;s home or new moms have checked out of facilities such as The Birth Center in Murray. "Most moms are discharged at four to six hours post-birth, so we choose to do screens at a 48-hour follow-up visit with mom and baby," said Adrienne Trahnstrom, a licensed midwife at the center, which collected 87 samples in 2012  37 percent of which got to the lab late. State rules say, "If the newborn is discharged from an institution before 48 hours of age, an appropriate specimen must be collected within four hours of discharge." Repeat samples can be taken to rule out false positives, which can happen with premature testing. But that again raises the cost and subjects infants to unnecessary testing. "In our practice we do newborn screens with every baby. But we know of some centers that discourage moms and say it&apos;s not necessary," Trahnstrom said. Newborn screenings comprise the lion&apos;s share of public health testing at the Utah Public Health Laboratory. Four or five employees are responsible for accurately and swiftly processing an average of 50,000 samples a year. 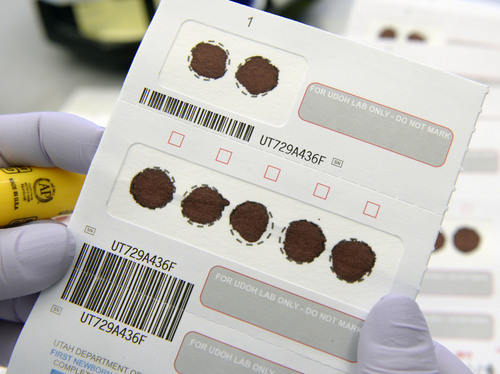 The process starts in the sorting room, where technicians check for missing patient information or torn, wrinkled and partially soaked blood samples, then scan the cards into a computer system. Scientists take tiny hole punches from the samples and place them inside plastic trays for analysis using reagents. Some of the reagents applied to the samples must be weighed down to one-ten-thousandth of a gram, said lab director Norm Brown. "It&apos;s something we take seriously." Gels and liquid chromatography are also used to analyze samples. And a perforated section of each card is sent to ARUP Laboratories at the University of Utah for mass spectrometry testing that the state lab isn&apos;t equipped to interpret.